This, regardless of forms and doctrines, is Dharma, the three-fold aspects of which are SATHYAM, SHIVAM, SUNDARAM - Truth, Love and Beauty. For these values our forefathers lived and died. So did Sri Ramakrishna Paramahamsa, Swami Dayananda, Swami Vivekananda, Gandhiji and Sri Aurobindo, among the moderns.These values are embedded in our national outlook, we command the respect of the world because of them. 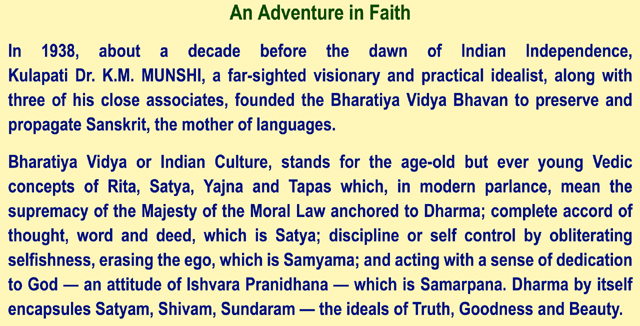 The Bharatiya Vidya Bhavan stands for the re-integration of Indian Culture and re-vitalization of Dharma in its three-fold form of Truth, Love and Beauty.-Satyam, Shivam, Sundaram.Kulapati Munshiji's vision of education based on fundamental values is the aim & objective of all Bhavan's institutions. Ideal education should impart knowledge, shap the character, and mould the personality of the child; it should assist hi in imbibing and assimilating the social, moral, ethical, and spiritual values so necessary for the development of an attitude of service. Effective education should help in transforming the child into what our Shastras describe as "Puranapurasha". The real strength of the Bhavan would lie not so much in the number of its buildings or institutions it conducts, nor in the volume of its assets and budgets, nor even its growing publication, cultural and educational activities. It would lie in the character, humility, selflessness and dedicated work of its devoted workers, honorary and stipendiary. They alone can release the regenerative influences, bringing into pay the invisible pressure which alone can transform human nature. "Dr. K.M. Munshi was a great scholar, a practical idealist and a visionary and if the Bharatiya Vidya Bhavan has sustained itself for 60 years and has grown from strength to strength during this period, it is because of the wisdom and imagination behind this institution. Of course, he had great successors who have sustained this institution with equal wisdom and imagination. 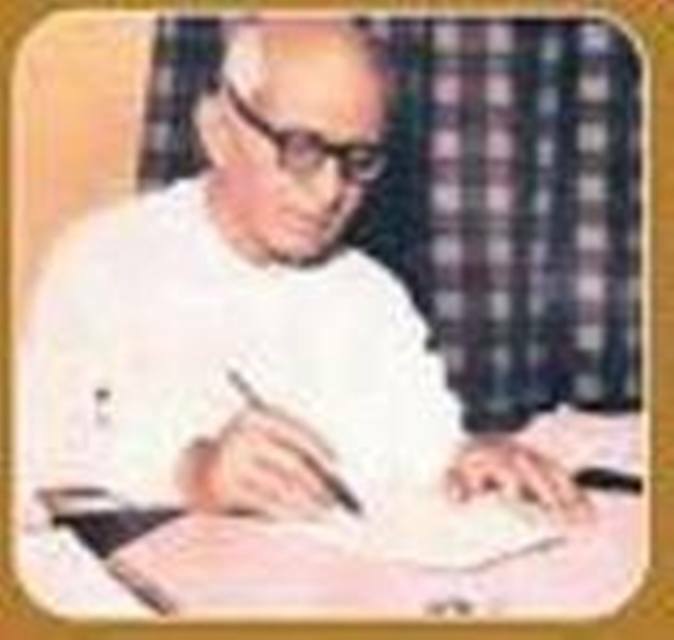 The Bhavan has made a crucial contribution to the advancement, in the younger generation, of education and to the cultivation, in the younger generation, of ethical and spiritual values of our civilisation."